The report National e-Strategies for Development, Global Status and Perspectives, 2010 is a publication in the framework of the World Summit on the Information Society (WSIS) on the occasion of the fifth anniversary of the WSIS’s Tunis phase and the adoption of the Tunis Agenda for Information Society. The Report reviews the progress in the elaboration of comprehensive, forward-looking and sustainable national e-strategies, and makes recommendations on policies and measures. This includes ICT strategies and sectoral e-strategies as an integral part of national development plans and poverty reduction strategies, as was called for by the Tunis Agenda for the Information Society. 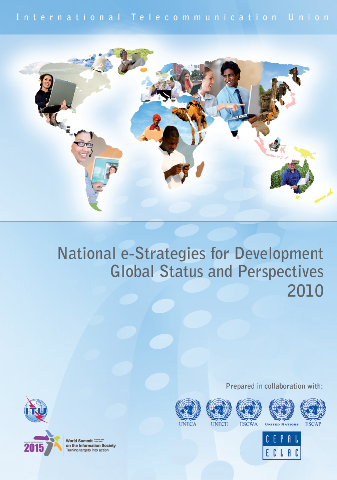 What is the status of the national e-strategies worldwide in 2010? What are the approaches/trends in the ICT strategies? How can they be explained? What is the status of the sectoral e-strategies in particular? Which common trends can be observed? Have national e-strategies been integrated into poverty reduction strategies? How do the ICT strategies evolve? The report shows that as of April 2010, 163 countries and territories, that is, 85.3 percent of all economies, already had some sort of a national e-strategy in place, while other 13 countries and territories (6.8%) are currently on their way to formulate and adopt one. The report emphasizes, however, that there is still room for improvement of existing plans especially regarding the strategic orientation and integration of ICT into national development plans and poverty reduction strategies. Another identified area for further improvement is the strategic integration of the potential of ICT in the different sectors. Obviously, there is a consensus among the stakeholders that policy areas like health care, agriculture, environment protection and so on could benefit from ICT use. Therefore, many initiatives and projects are in implementation. Nevertheless, the formulation of a national sectoral e-strategy on the basis of these experiences is still lacking in many countries in order to make use of the full potential of ICT for economy and society. Many national e-strategies follow the same approaches: telecommunication regulation, ICT as driver for economic growth, innovation and employment and capacity development of ICT professionals. Common trends are also around the establishment of transactional e-government solutions, making the national ICT industry globally competitive, and following the WSIS multi-stakeholder approach. Infrastructure stays a concern, broadband and mobility are the two major technological trends governments are addressing. In most strategies, the private sector plays a crucial role in deploying ICT infrastructure. Therefore, almost all countries continue their path towards liberalisation, in order to stimulate the market through competition. Price reductions on tariffs are another effect expected to arise through increasing competition. A sense of increasing competition between economies in the ICT sector is driving national ICT strategies. Many governments are either intending to benefit from increasing export of ICTs or outsourcing into their own country, or are trying to protect their position. Issues of intellectual property rights, international standards and economic regional integration are therefore becoming more visible in national e-strategies. Other commonality observed among the studied e-strategies plans reveals that many countries focus on making their own ICT industry globally competitive. Well educated and skilled ICT professionals become therefore a rare good, economies are competing for. Additionally, confidence and security are still a concern in many national e-strategies. Governments and other stakeholders obviously agree that they need to take measures to establish trust in ICT applications. This development is probably also stimulated by the two most prominent sectoral applications of ICT, namely e-government and e-business. In these two sectors, sensible transactions are taking place, and an uptake of usage by citizens and customers depends on their trust onto these technologies. One unique feature of the whole WSIS process has been its multi-stakeholder approach. This successful approach is followed by most governments also on the national level, involving civil society, NGOs the private sector, academia, and regional and international organisations. This approach has been probably so successful because ICT matter for all aspects of economy and society. ITU will continue to support its Member Countries in their efforts to elaborate and improve their national e-strategies and to keep track of the worldwide development in this area. Major sources for this report were the WSIS Stocktaking of the International Telecommunication Union (ITU) available at: http://www.itu.int/wsis/stocktaking/index.html, national ICT and sectoral e- strategies of the Member States and contributions from the five UN Regional Commissions: UNECA, UNECE, ESCWA, ESCAP, and CEPLAC. The report focuses mainly on the elaboration of national ICT strategies. The implementation of these strategies in form of policies, action plans, initiatives or projects is not considered within the scope of this report.